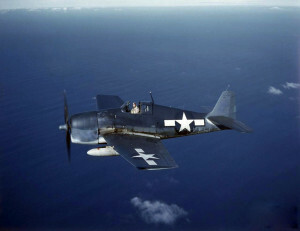 On the night of April 5, 1945, a navy ensign was practicing “touch and go landings” in an F6F-5 Hellcat, (Bu. No. 71109), at Charlestown Auxiliary Naval Air Station in Charlestown, R.I. His first five attempts were successful. As he was approaching the runway “low and slow” for his sixth landing, the Runway Duty Officer noticed that the plane’s landing gear was still in the “up” position. The duty officer fired a red flair to warn the pilot not to land, but the flair was released at about the same time the plane was about to touch down. The aircraft hit the runway and the belly fuel tank was torn open as the plane skidded to a stop. Fire engulfed the aircraft, but the pilot escaped with relatively minor injuries. The aircraft was a total loss. Source: National Archives TD450405RI, via Larry Webster, Aviation Historian, Charlestown, R.I.